We love a good fashion week show that makes headlines! Especially when it has a message that goes beyond just fashion and style, and includes themes of female empowerment. Over the past few years New York Fashion Week has become a place where we are seeing some important statements being made on the runway which is contributing to the growing movement of inclusive fashion. We’ve seen designer Carrie Hammer include differently-abled models, real life female role models, and those who are not necessarily considered “high fashion” examples in the traditional sense. The increased number of plus size models and collections point to a changing fashion landscape that is finally starting to represent a little more of the real world, than some ridiculous idea of “aspiration” which only a small percentage of the population is able to emulate with their natural body size. This year, Italian fashion company FTL Moda, who are well-known throughout the fashion industry for pushing the boundaries and challenging stereotypical images of beauty, once again used their platform to raise awareness about a topic that affects a number of women around the world. One of their models was Reshma Qureshi, 19, from India who is an acid attack survivor. In 2014 her sister’s estranged husband and his friends pinned her down and doused her with acid, disfiguring her. She has since become the spokeswomen and face of an advocacy organization called Make Love Not Scars which helps survivors and victims of gender-based violent crimes. One of the videos she is featured in where she shares beauty tips and talks about the organization’s campaign to ban the open sale of acid has over 1.8 million views. It was her first time traveling out of the country, and Reshma confidently strut her stuff on the runway wearing a stunning outfit from Indian designer Archana Kochhar. But it was her spirit of courage and bravery despite an horrific attack which stood out most to onlookers present. Reshma was chosen for the FTL Moda show to help inspire other victims to know they are not alone, and that they should not give up on life. “No one else understands what an acid attack is except the survivors themselves. I do not want this to happen to anyone else,” she told the press through a translator. According to the Guardian, acid attacks overwhelmingly target women and children in Asia, sub-Saharan Africa, the West Indies and the Middle East. India records the highest number of attacks, between 500-1000 each year, yet a spokesperson from London-based charity Acid Survivors Trust International (ASTI) says the real number is much higher. “There are whole swathes of regions across the globe where acid attacks are occurring but are not being recorded. It is not reported for fear there might be reprisals from the perpetrators due to the fact that survivors and their immediate family have no confidence in the police or the judiciary to take action,” said Jaf Shah, executive director of ASTI. These insidious attacks are most commonly made by jilted husbands or rejected suitors who want to permanently do damage to a woman’s appearance, not to mention the long-term psychological impact it can have. In a sick way, it is as if the bruised ago of the rejected suitor feels it needs to retaliate to the woman to tell her she has no right to make her own decisions. But the more survivors like Reshma refuse to stay silent, they give other victims hope for a prosperous and confident future. “Why should we not enjoy our lives? What happened to us is not our fault and we’ve done nothing wrong and so we should also move forward in life,” said Reshma to the press the night before her NYFW debut. “Victims coming forward are defying the perpetrators of the attacks,” said Jaf Shah. 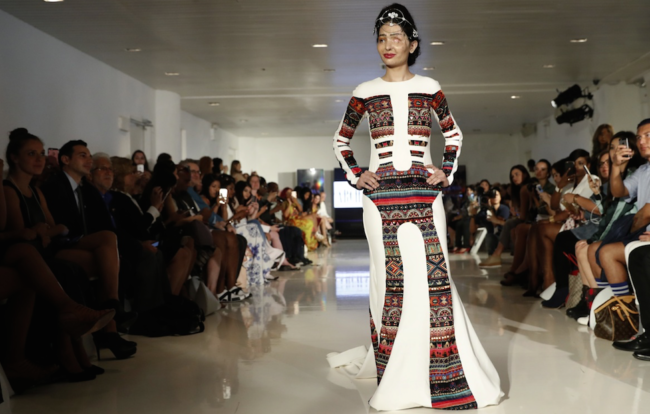 In an ironic twist, the FTL Moda show took place on the same day that an Indian court sentenced a man to death for murdering a woman by throwing acid on her face after she rejected his marriage proposal. It was a landmark decision, the first of its kind which has been handed down to a perpetrator of an acid attack in India, sending a loud and clear message that this crime will not be tolerated. 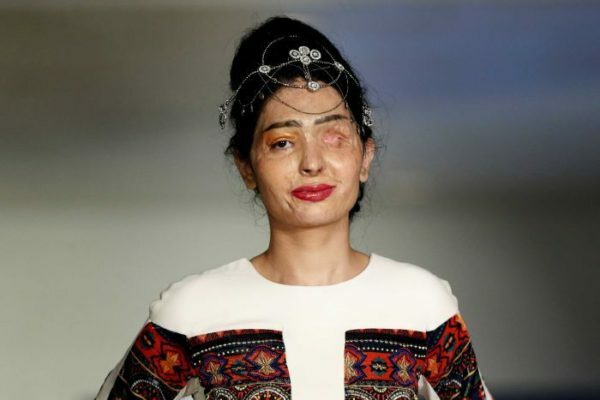 Reshma told the press that she does feel “brave” for speaking publicly about her ordeal and agreeing to be part of the FTL Moda show. She was accompanied by someone from the Make Love Not Scars organization, and although she was overwhelmed by the experience and understandably jet-lagged, she was firm in what her presence on the catwalk represented. “I want to tell the world – do not see us in a weak light and see that even we can go out and do things. 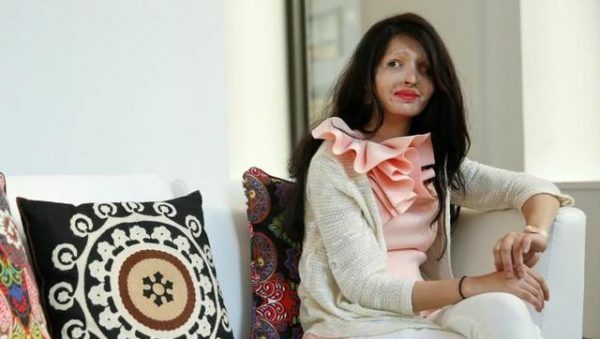 People have a tendency to look at acid attack survivors from one perspective and I don’t want them to look at them like that anymore,” she said. FTL Moda founder Ilaria Niccolini expressed her feelings about having Reshma take part in a show that shared an important message with the world, and how fashion can be an instrument for change, as well as style. “I think this is a powerful tool. I think it can make a change for the better,” she said. To see more from FTL Moda and how they use their platform to advocate for important issues, click here. 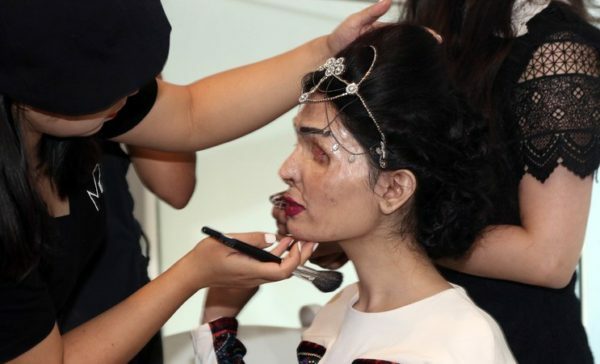 To learn more about Reshma Qureshi, her experience at NYFW, and how the organization is helping other acid attack victims in India, click here.